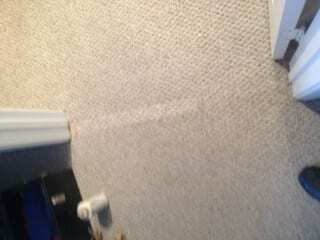 Berber carpet can be very tricky to repair. You should only let an IICRC certified technician take his blade to your carpet whether its Berber or not, however this is especially true with patterned or Berber carpet because you dont want an inexperienced technician compromising the pattern/loops. Here is a great repair our senior technician did this week. The piece we used was pulled from a closet and we placed a non matching beige or brown piece back in the closet. 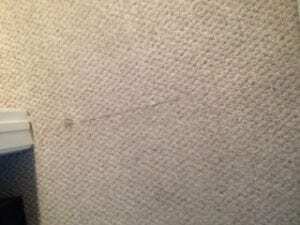 The lighter color is present because the carpet in the closet is not as soiled or worn as the surrounding carpet, but a good seam cleaning will help with this.